An interview between gallery owner Esther Niebel and Daniel Müller Jansen about South Africa and his two series there is me & there is you and Overexposed. Esther Niebel: What were your impressions when you took the first shots for your series there is me & there is you in 2008? What was your starting point, how did you approach these impressions photographically? Daniel Müller Jansen: It all began on my way from the airport into Cape Town. Coming into the city, I was confronted with a divided world. On one side of the motorway, there were gated communities like colourful pearls on a string. On the other side, a mix of townships and social housing. I found this huge contrast very disturbing. To me, this motorway into the city perfectly illustrated the gap between rich and poor. 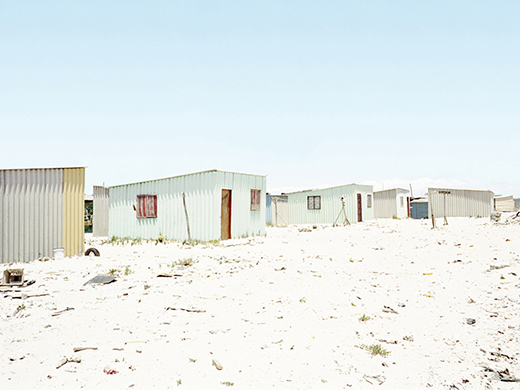 My first South Africa series there is me & there is you showed exactly this dichotomy of ghettoization – the gated communities of the well-off, mostly white, part of the population and, in contrast, the social housing projects of the mostly black population. My goal was to create a series of architectural pictures which would really capture the phenomenon sociologically, politically and also aesthetically. My most important realisation while working on this project was that architecture is the packaging, the wrapper if you will, of a society and its attitudes. 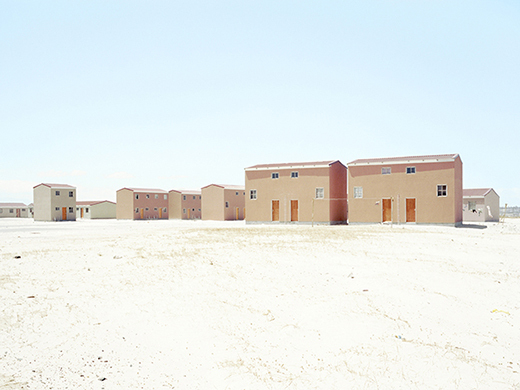 I tried to portray the housing estates as such in my photos. The series is therefore a portrait of a society. It doesn’t concentrate on individual stories but rather on location and architecture, devised and built by humans for humans. You have continued your series until this day. In your opinion, has anything changed concerning this phenomenon of gated communities? For the wealthy, gated communities symbolise the achievable dream of an orderly and safe living environment. But, at the same time, they’re something like parallel worlds which demonstrate a new form of segregation. 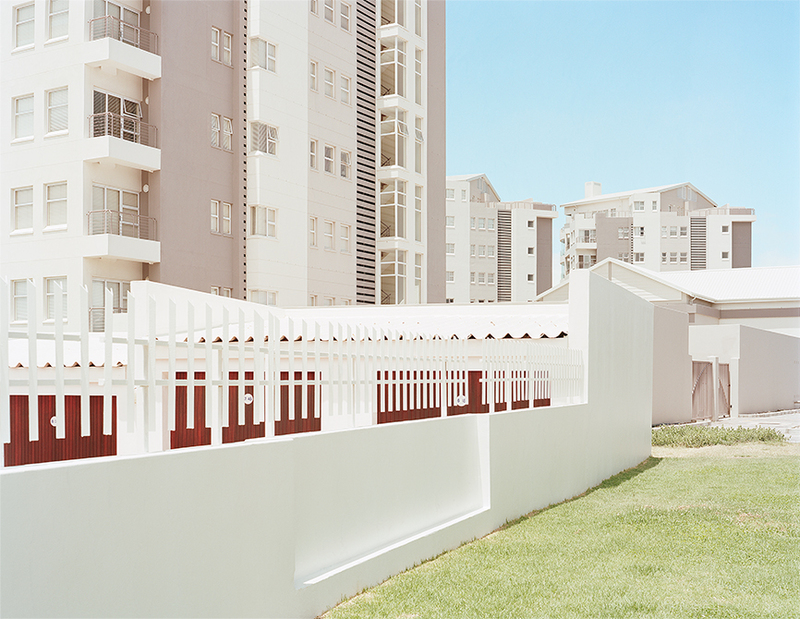 The gated communities of South Africa have long since become a mass phenomenon – which is why I focussed on them again in my second series Overexposed. 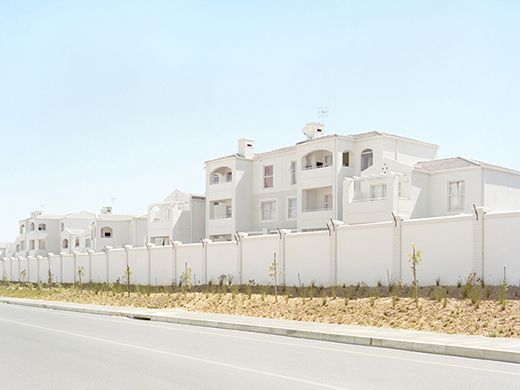 Overexposed portrays the gated communities as apparent versions of inner paradise and spaces of escapism which, viewed from the outside, resemble a modern version of a stronghold. On the outside, a part of society is protected through walls which rise as high as 3 m, electric fences, cameras, barriers and guarded entrances, while it subjects itself to various rules and codes on the inside. 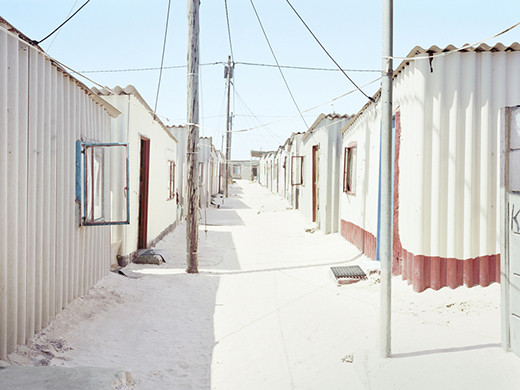 The series Overexposed plays with this Inside and Outside and shows spaces of community and simultaneous segregation. 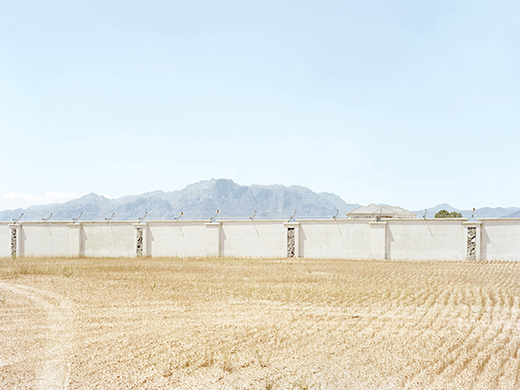 But the interesting thing is this: The more a part of society tries to protect itself with walls and fences, the more evident the needs and fears of these people become – the title Overexposed and the exaggerated aesthetic of my work allude to this fact and highlight the pictured architecture as well as the attitude of its inhabitants in more than one way. Long exposure as your artistic medium plays an important part in both of your South Africa series there is you & there is me and Overexposed – the title even alludes to it. It gives your pictures something of a picturesque and surreal quality. What are you alluding to? My inspiration for my South African work was Mannerism. Since my days in university, I’ve been fascinated by the luminance and chromaticity of mannerist paintings. In my South African series, I’ve used purposeful overexposure of analogue film to achieve a similar luminance and chromaticity. This let me emphasise the artificial and exemplary qualities of the architecture as well as the attitude and manners of its inhabitants. My photographs also have a mannerist aspect and portray a society in which manners don’t just illustrate decorum and conventions but also boundaries. Do you see your work as purely artistic or does it also have a political dimension? My work has a picturesque quality and visual power combined with a socially critical aspect. This dichotomy makes my photographs attractive and repellent at the same time. Initially, the beholder will be attracted by the special aesthetic and pastel colours. 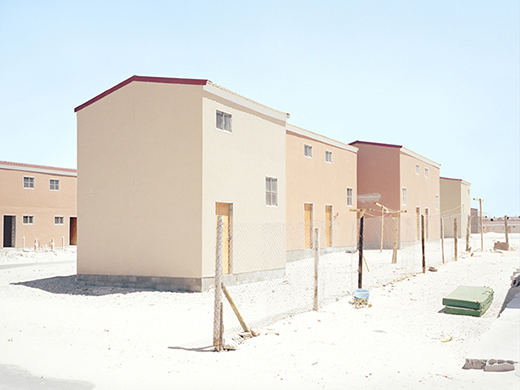 At second glance, however, the photographs raise questions about the architecture shown. Architectural reality is exactly like that in South Africa. Something can be perceived as beautiful at first glance and suggest an improved quality of life. But at what price? Where is South African society going? What kind of world do we want to live in? Do you think that your series about gated communities in South Africa which you started eight years ago are something of a harbinger of a growing worldwide phenomenon? Why? You can find gated communities all over the world but mostly in countries and cities where the gap between the rich and the poor is very pronounced. From Mexico City to Rio de Janeiro and from Moscow to Dubai. The further globalisation progresses the stronger our need for smaller structures and communities will become – gated communities are a kind of microcosm which fills exactly this need. But, and this is where it turns into a bit of a touchy subject when we’re talking about South Africa, gated communities can be seen as a new form of segregation. During times of Apartheid, Black and White were separated, today it’s Poor and Rich. People who have to rely on help and subsidies are mostly black people in townships and housing projects, wealth is mostly distributed among the white population. This state is a time bomb! There is a desire for a common future in South African society, but the need for an improvement of the status quo and as well as independence and equal opportunities for everyone represent a great social and political challenge. Will you continue working on the series? Do they have a processual component and if so, can you describe it? Hardly anywhere else in the world is the gap between rich and poor larger than in South Africa. More than 18,000 homicides a year give it one of the highest murder rates in the world. The South African Security Minister even referred to his country as a ‘killing field’. The unofficial unemployment rate is over 30 percent and the average life expectancy is 49 years, which is significantly lower than the average for the entire African continent. The spread of HIV in South Africa is a lot higher than the African average.